Creating beautiful holiday desserts doesn't have to take hours of baking. This eggnog tart recipe is festive and easy and are the perfect treat for your seasonal dessert table! Cut time by using pre-made tart shells, then fill them with a delicious rum-flavored eggnog cream. These star-studded mini tarts are sure to wow your guests! Arrange one package of tart shells on a baking sheet. Using an electric beater, beat together the sugar and eggs until light and fluffy. Stir in evaporated milk, water, rum, salt, nutmeg and cinnamon. Pour into the tart shells and bake for 25-30 minutes or until crust is golden and filling is set. Remove from the oven and cool. Remove the remaining tart shells from the foil tins. Transfer to a lightly floured work surface and press to flatten. Using a 1 1/2 -2” (3.5-5 cm) star shaped cutter, cut a star from each piece of pastry. Place on a parchment paper lined baking sheet and bake for 8 minutes or until nicely browned. Remove from the oven and cool completely. Mix icing and nutmeg together and place in a small piping bag. Pipe a thin line of icing around the edges of each star. 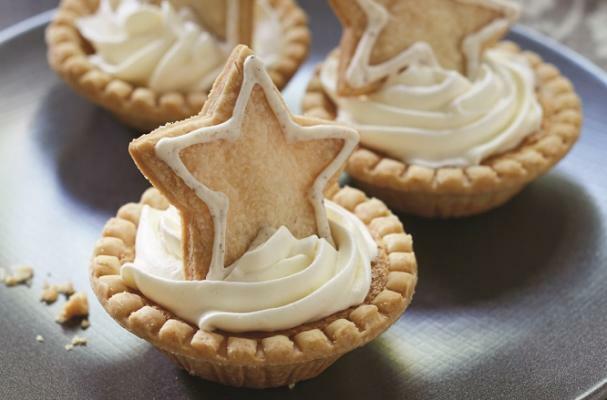 Top each tart with 2 tbsp (30 mL) of whipped topping and garnish with a star.